Fast bowler Mark Footitt says he hopes he can play a key role after returning to Derbyshire on loan. The 32-year-old, who claimed 251 wickets in 64 first-class matches for Derbyshire between 2011 and 2015, has made the temporary switch from Nottinghamshire and played in the Specsavers County Championship match against Warwickshire last week. After suffering an injury towards the end of last season, the quick bowler is now looking forward to putting in strong performances for Derbyshire, starting with the visit of Durham on Friday. 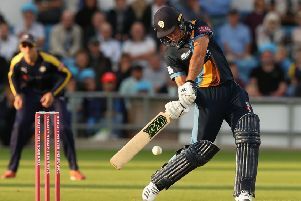 Footitt said: “It’s been a long winter after having a stress fracture in my neck, so it’s worked quite nicely that I can get a couple of four-day games and a few one-day matches for Derbyshire to help the team and get my rhythm back as well. “When you bowl in the nets, there are no consequences. If you bowl a bad ball, you don’t know if it’s gone for four, but the pressure is on you in a game. “So I’m looking forward to playing again for Derbyshire. It’s a good bowling attack with international quicks, and I know Ravi Rampaul from my time at Surrey. He is a very good bowler.